Do you sink your teeth into creating usability tests, user flows, and prototypes? Does your heart race for beautifully met user goals and data-driven design? Then buckle up, Buttercup, because we might just have the job for you. Sparkbox is a small company with big clients who are looking for the flexibility of world-class responsive web design. We're smart about how we meet client goals, we work hard on innovative solutions, and we love a challenge. UX is a critical part of everything we deliver, and we’re looking for someone to take that even further. The right designer will be a UX expert who can promote, teach, deliver, and act as a liaison with clients. We want you to continue to build UX into the Sparkbox culture, and you’ll be responsible for discovering how we need to improve, set vision and strategy, create the right processes, and drive the daily execution of UX into Sparkbox. We want you to be our UX subject matter expert and help convince clients that we have the techniques and skills to meet their goals. 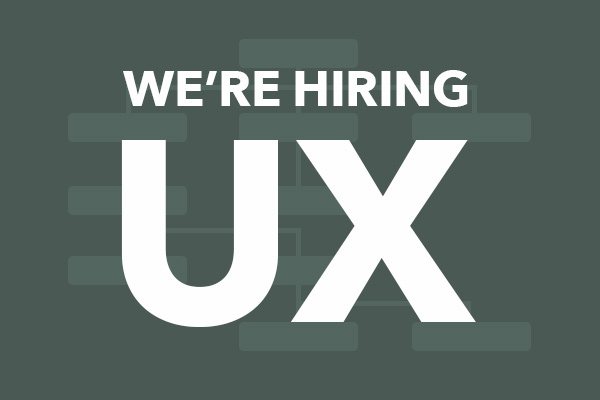 You’ll be the only dedicated UX person at Sparkbox, but you won’t be alone! You’ll also work elbow-to-elbow with Sparkbox’s frontend developers, visual designers, and content people, delivering UX for clients on a daily basis. You’ll own the UX and work to make our products better. To do that all well, you’ll talk with clients, a lot. You’ll work with clients and their customers to take projects from idea to design to iteration to launch. You’ll be an insight diplomat translating the needs of users, developers, and clients to each other. You have to be practical. Yes, we want to make data-driven decisions to reduce risk, but we don’t want to be paralyzed by analysis. We need you to tell us what the threshold is. You have to be smart enough—and humble enough—to know when what you know about UX techniques won’t be enough for a project and call in specific UX discipline experts to help you out. Big company UX experience is a big plus. We’d love it if you want this to be a 5-day a week, in-the-office job, but you have to be in the office with the team at least 2-3 days a week. So it helps to live within the extended commuting distance of Dayton. It is a plus to have an understanding of, and be curious about, responsive web design UX and IA best practices. We know responsive web design—we debate it all day long, dream about it—and before long, you’ll be one of us. Heuristic Reviews and Competitive Audits: Performing heuristic evaluations of client and competitor sites to determine opportunities for improvement and innovation, contributing to Sparkbox’s repository of responsive web design solutions. User Research & Discovery: Conducting contextual inquiry (in-person observation and interviews) with target users to understand their mental models and behaviors, unmet needs and goals, and emotional connections that can lead to insights and better-serving designs. Usability Testing: Designing, scripting, and conducting usability testing for performance, adding interview and survey ratings to evaluate perceptions and preference, and analyzing the results. Research Analysis & Reporting: Analyzing information gained during user research and evaluation, and making data-driven design decisions. Features & Functions Planning: Helping to recommend tactics and features that will best serve the user, the business, and technology. Persona & Scenario Development: Defining target users and authoring detailed user personas and scenarios to help our team and client develop a deep understanding of the end user. Modeling Work- and Task-Flow Creation: Conceptualizing ideal user interaction paths/task flows/scenarios, etc., based on user mental models and optimizing work- and task-flow design. Information Architecture: Building navigational systems, site maps, wireframes, etc., as the foundation for our projects and to solve outstanding responsive web design challenges. Prototyping and Iteration: Leading the multi-disciplinary team through low- and high-fidelity prototyping, to elevate our design thinking and establish new, intuitive interaction design patterns. Celebrate, Debate, and Build with the team.